DUBAI, UAE, March 14, 2019 /PRNewswire/ -- In Danfoss' compressor factory in Wuqing, China, automatically-guided vehicles drive up and down the aisles and supply workers with components. 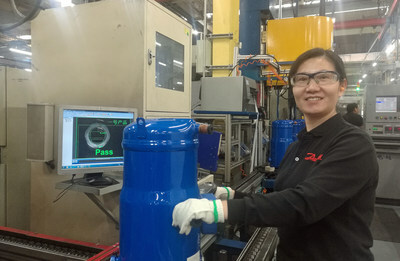 The same workers use intelligent Bluetooth connected tools that automatically tell if an assembly process is incorrectly performed. They also have access to step-by-step electronic work descriptions – no matter where in the factory they work on a given day. The list of smart technologies, which the factory has invested in over the last few years, is very long. What's more, the investment has paid off. Compared to two years ago, employee productivity has gone up by 30 percent, scrap costs down by 20 percent, and customer complaints down by 57. And, now, Danfoss in Wuqing has made it onto the World Economic Forum's list of 16 of the world's smartest factories. The Forum identifies a smart factory as one which is not only good at adopting smart technologies, but also at turning the investment into operational and financial benefits. Making the list, the Forum has selected from a group of more than 1,000 factories. "Representatives from the World Economic Forum recently audited our site during a full day. We are very proud of the result – that we made it onto this final shortlist. It's a clear testament to the fact that our digitalization effort has also paid off in terms of productivity, quality improvements, and customer satisfaction. We will continue adding new technology, so we constantly improve in these areas," says Senior Director of Operations Ruixing Zhang, Danfoss in Wuqing. "In Danfoss we work with digitalization on all levels in the organization. And we invest heavily in this area, to secure that we are ahead of the curve, and that we meet the expectations and demands from our customers. So, we are very proud, to get recognized for this," says Danfoss President and CEO, Kim Fausing. Danfoss' commercial compressors are used in cooling and refrigeration systems worldwide. Helena Leurent, Head of the Shaping the Future of Production System Initiative, World Economic Forum: "The 16 selected factories are leaders in the technologies of the Fourth Industrial Revolution. They create value and resilience through the supply chain, and agility and responsiveness for customers." Facts: The Wuqing factory has 600 employees and is one of several Danfoss factories systematically investing in and using smart technology. Another example is Danfoss Drives in Gråsten, Denmark. Tour the Gråsten factory and its smart solutions in this digital story. Apart from Danfoss, the group of 16 factories includes companies such as BMW, Procter & Gamble, Siemens Industrial Automation Products, and Schneider Electric. Danfoss engineers advanced technologies that enable us to build a better, smarter and more efficient tomorrow. In the world's growing cities, we ensure the supply of fresh food and optimal comfort in our homes and offices, while meeting the need for energy-efficient infrastructure, connected systems and integrated renewable energy. Our solutions are used in areas such as refrigeration, air conditioning, heating, motor control and mobile machinery. Our innovative engineering dates back to 1933 and today Danfoss holds market-leading positions, employing 27,000 and serving customers in more than 100 countries. We are privately held by the founding family. Read more about us atwww.danfoss.com.